DNS Associates is a national accounting firm offering comprehensive accounting solutions to our clients. We are chartered accountants, Slough and are experts for contractors. With our unique approach and proactive solutions, we have helped thousands of contractors with their accounting requirements and finance management. WHY SHOULD YOU CHOOSE DNS ASSOCIATES? At DNS Associates, our focus is to combine our extensive expertise and consistent commitment to deliver the highest standard accounting services to our clients. We help contractors with accounting, taxation and enable them to take the best financial decisions. We are an award winning accounting firm and have received prestigious awards like the British Accountancy Awards 2013. With our tried and tested strategies we have been guiding clients in Slough and all across the UK. While selecting an accountant to fit your demands, you need to be able to distinguish them based on the quality of services they provide. With the availability of so many accounting firms, this is never a simple job. That is why you need to assess each accountant based on their reputation, range of services they provide and their reliability. At DNS Associates, we meet all these specifications and our competence to deliver the finest accounting solutions to our contractors is what makes us different from other accounting firms. The recognitions we have received for our excellence and the testimonials of our satisfied customers clearly demonstrate this. Having worked with numerous contractors from health, technology, construction, management and other business sectors, we understand their requirements and execute them flawlessly. 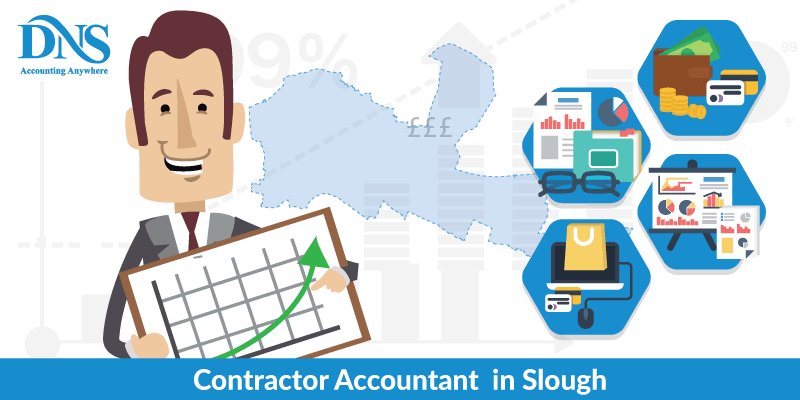 We have made a trusted name as IT Contractor Accountants, Slough. We give utmost importance to the satisfaction of our customers. That is why you need to pay for our services only if you are completely satisfied with them. In short, we give you a 100% satisfaction guarantee. We stay true to our claims. At DNS Associates, there is no compromise when it comes to quality. We offer special packages to contractors at affordable rates. You can choose between our starter, basic, premium and gold packages depending on your requirements. Depending on the stage of contracting you are at, our specialists will help you carry out your tasks efficiently. As you are entirely new to the contracting field, our experts will guide you through every step so that you can make a confident start in this sector. We can resolve all your worries regarding the IR35 legislation. We will ensure that you comply with it and also offer protection from IR35 related risks. We will also guide you with VAT registration. Most contractors do not fully understand its advantages and hence miss out on the gains provided by VAT. We ensure that this does not happen to you. Our strategies are aimed at increasing your earnings by assisting you in making all the expense claims you are entitled to. As a contractor if you choose to work using an umbrella company, you are losing a major share of what you can possibly earn. You need to spend more on National insurance and can make only few expense claims. This means you are earning far less than what you can. We advise contractors to choose this path only if they are in the contracting business for a short while and plan to leave contracting after three months or less. As a contractor using a limited company, are you fully satisfied with the services of your accountant? Are you certain that you get the complete value for the money you pay? It is time you evaluate these things because the right accountants will pave way for your success but the wrong ones will diminish your chances of it. At DNS Associates, we offer services beyond the basic accounting tasks. We provide a comprehensive range of services for contractors and enable them to make sound financial judgments. DNS is among the few accounting firms which offer regular management accounts. This will give you a clear understanding of your finances and you can take good decisions accordingly. DNS will guide you on making expense claims that you are entitled to and thus help you save more. As top tax accountants, Slough we have immense proficiency in tax planning and use these strategies to benefit you in the best possible way. We are contractor accountants Slough with extensive experience in helping contractors tackle different challenges. From IR35 reviews to making the best expense claims, our expert team will guarantee that you receive nothing short of the best quality solutions. Our services are also available to contractors in Windsor, Maidenhead, Egham, Harrow, Woking and Wembley.